Bill Long sent me a package with a number of flies he'd tied, after I posted an article about Bob Meade's realistic mosquito. 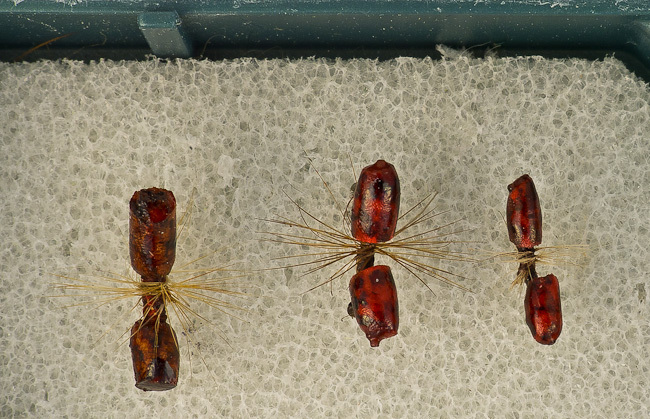 Bill is a fan of realistic tying and has modified/simplified a few well-known recipes to make his own realistic flies. In this package he has provided me with a few of his KISS ants and stonefly nymphs. The ant recipe was adapted from Ed Sutryn's McMurray Ant. In particular he has simplied its preparation by using foam cyclinders for the body. The stonefly is a "Masterclass"-type fly which uses a similar construction to what Edwards has in his book (Oliver Edwards: Flytyiers Masterclass). Bill has simplified Edwards' recipe and in fact skipped a step or two to speed things along. After reading one of the stories he sent to me about this fly, I think I'd call it the Up-in-a-Tree Nymph. You'll have to wait for the full story, but the name is sort of a give-away. 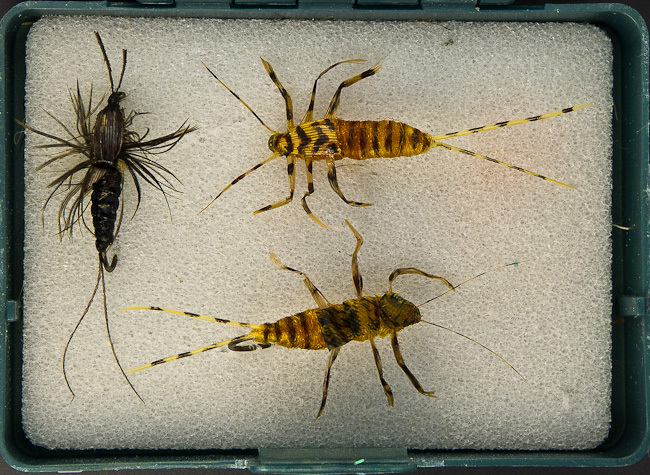 There was also in the package an easy-to-tie stonefly using Swannundaze. It's the darker nymph in the photo. Bill sent me complete instructions and comments, as well as some good story material for these flies. I will be using the flies and his text in the future to create one or more "Flies with a Story" for the Web site. Swannundaze nymph (left) and Golden Stone nymph (right).